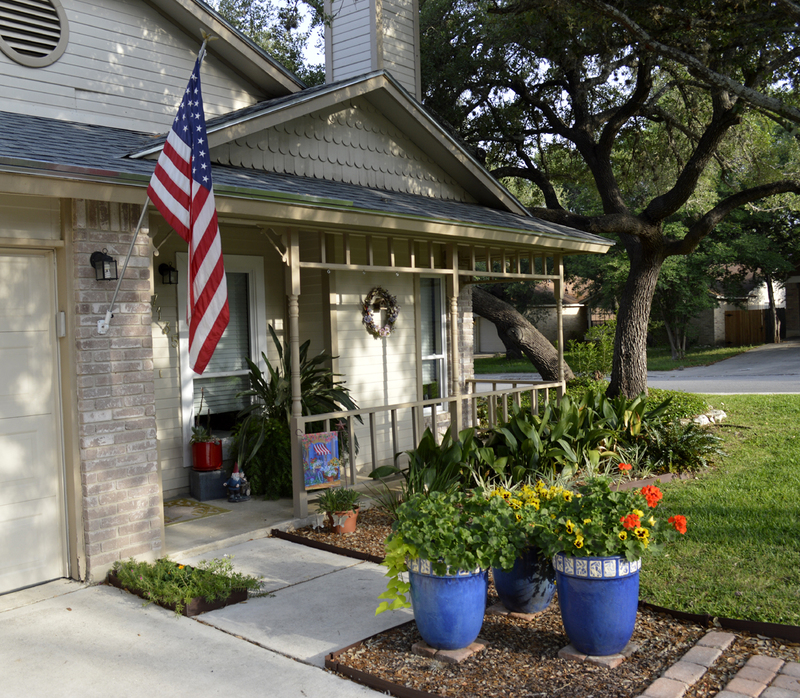 Our first step today is to mix colors for the terra-cotta containers and the Geraniums, as well as the Sweet Potato Vines, that will be planted in them. #1. 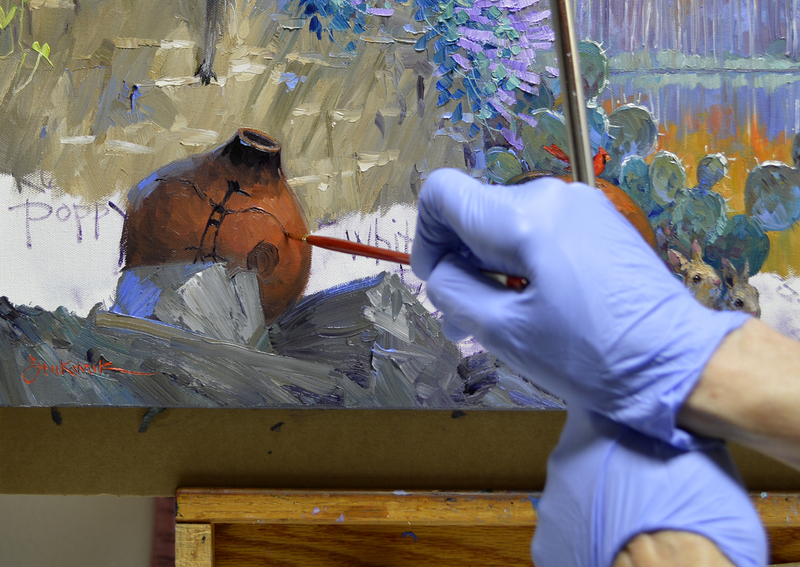 Three mixes are made in different proportions of MUD (Ultramarine Blue + Alizarin Crimson) + Cadmium Orange + a little Cadmium Red Light for the pots. #2. 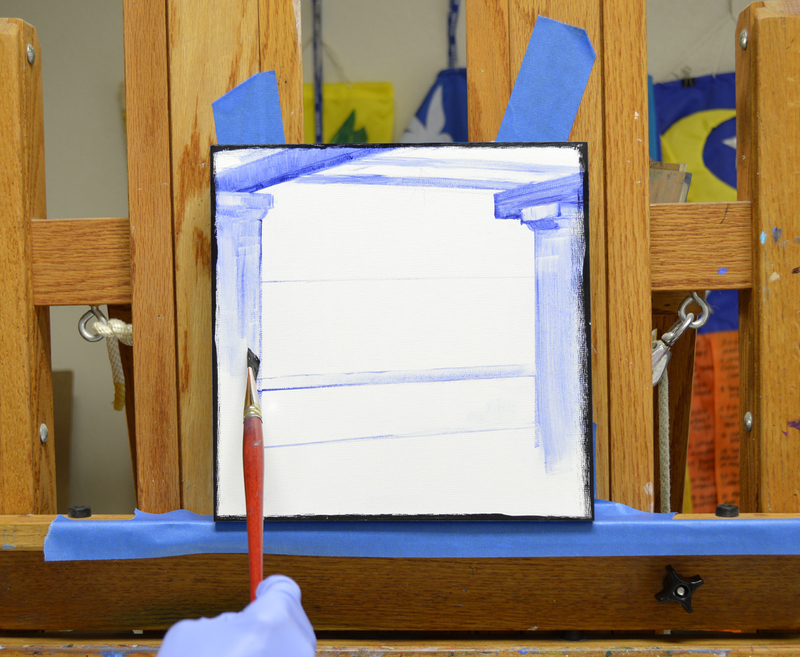 Ultramarine Blue + White. #3. Cadmium Red Deep Hue + Alizarin Crimson. #4. 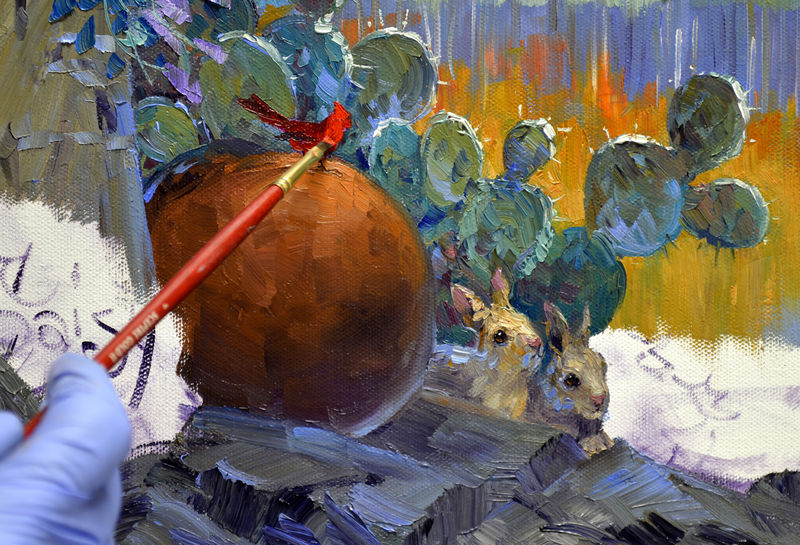 Cadmium Red Deep Hue. #5. Cadmium Red Light. #6. 3 combinations of Pthalo Blue + Lemon Yellow. #7. Pthalo Blue + Liquin. #8. Pthalo Blue + Lemon Yellow + White. #9. Three shades of Pthalo Blue + Cadmium Yellow Medium + Cadmium Orange + White for the Sweet Potato Vine. TALKING VIDEO! 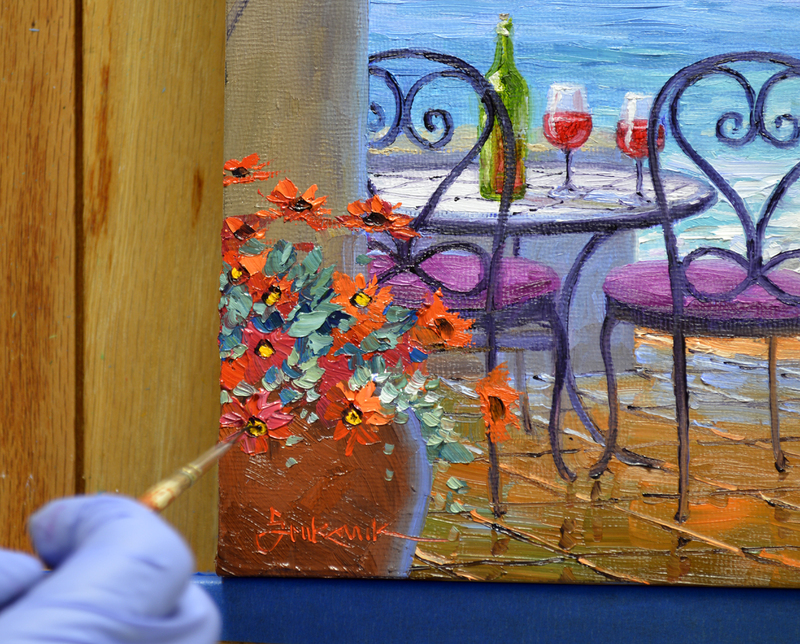 Painting the Geraniums Part I. And here is the second part. African Daises fill the container on the left. I was originally going to add some tall Gladiolas in the mix. 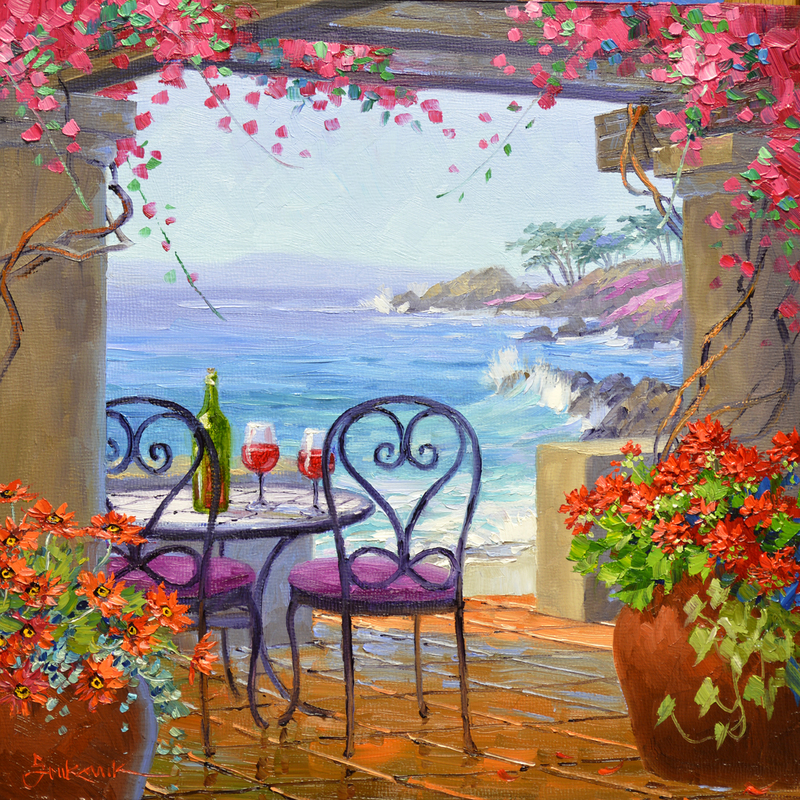 But I soon realized if I did that, the flowers would be so thick they would cover over the Infinity symbol on the chair. I know that “Figure 8” is far more important to my collector than the Gladiolas. Centers are added to the Daisies. First a solid dot is made with MUD + Liquin. Then I come back and make a smaller, Cadmium Yellow Medium dot in the middle of that. The final touch is a small speck in the center of the yellow with the MUD mix. You may enlarge the picture to see this more clearly, just click on the image. 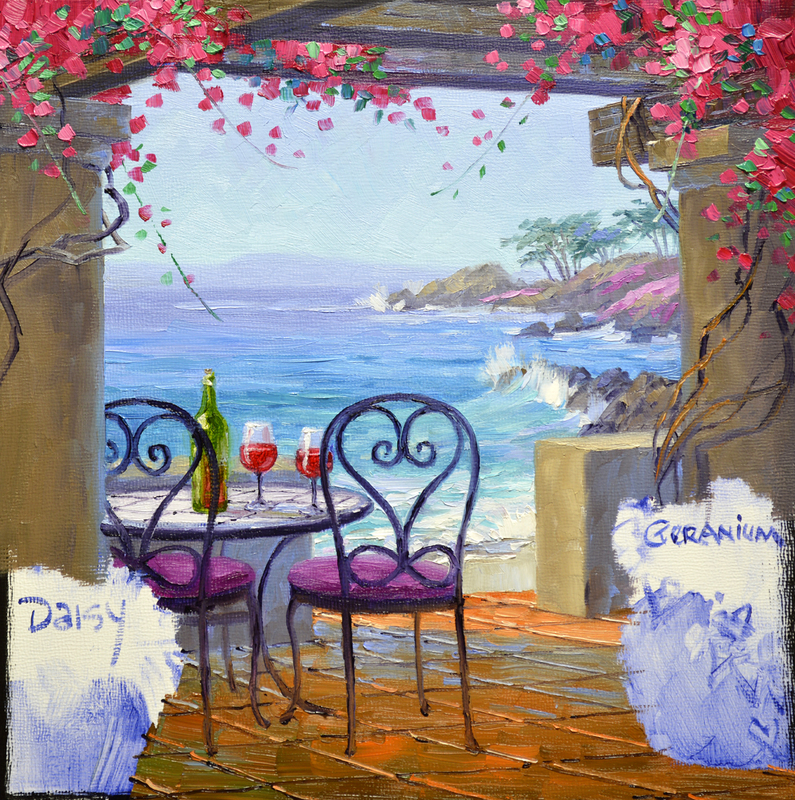 Gary and Kathy can sit on the terrace, sip some wine and go for a stroll on their own private Carmel beach. Their hearts are interwoven for eternity, the honeymoon is never over! Thank you for following along. AND for all of your encouraging words about my new “Talkie” Videos. The general consensus has been “DO MORE!” So I will do as I’m told! With HUGS and COLORFUL SMILES. 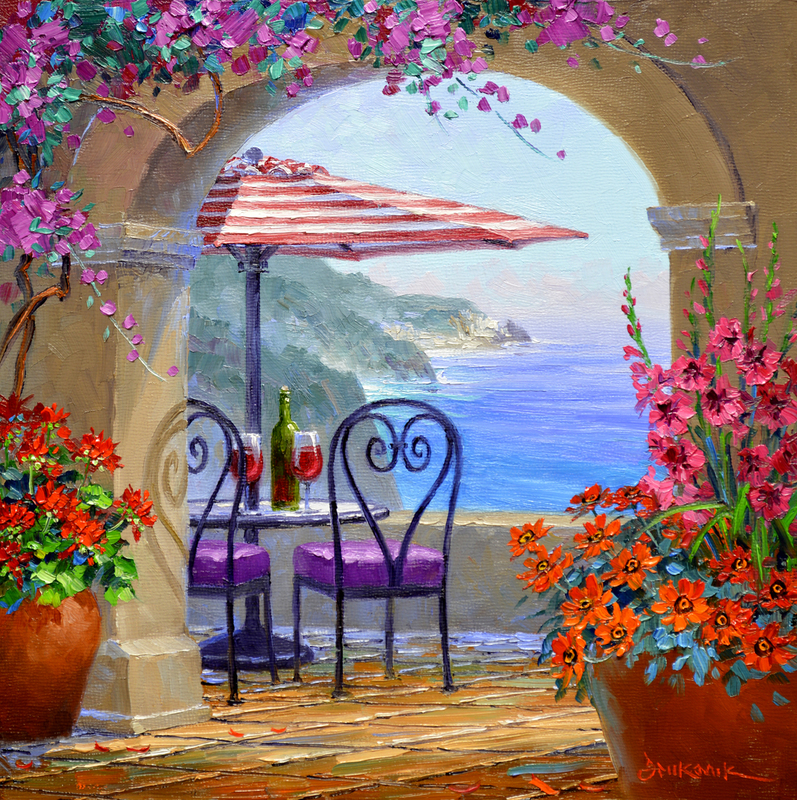 Hot Pink Bougainvillea, made of Permanent Rose + White, dips down between the weathered beams of the Pergola. As you read through my blog don’t forget, you may click on any of the images to see them larger. After adding leaves to the Bogie above, work begins on the bistro table. I’ve decided to make the top out of tile. 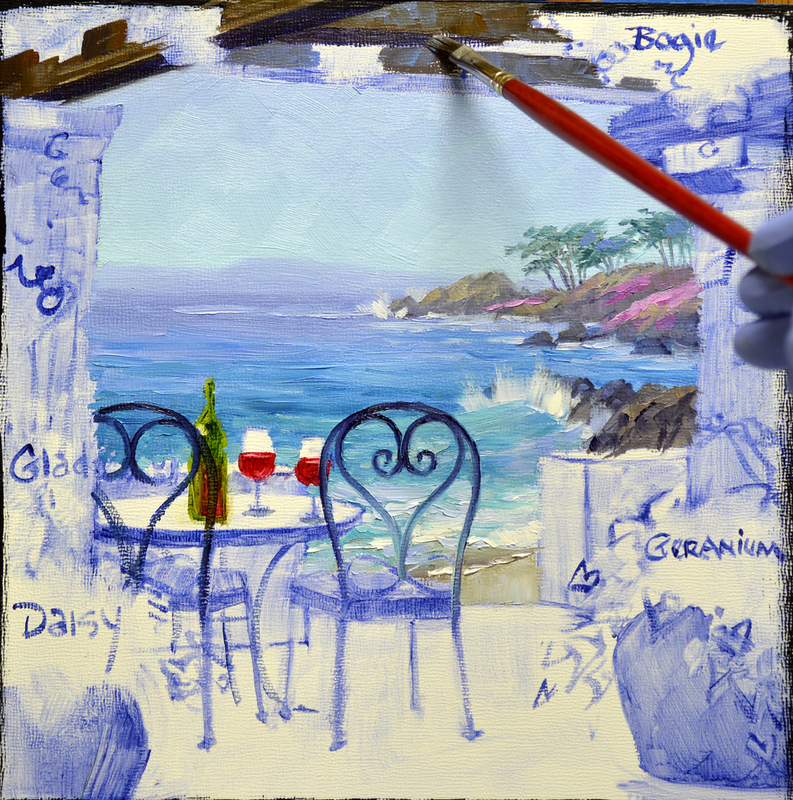 The entire surface is covered first, then the lines separating the individual ceramic tiles are drawn into the wet paint. Sunlight glistens on the wine bottle and glasses. Next, the Magenta seat cushions of the chairs are made. Gary asked if I could add the figure 8 “Infinity Symbol” below the heart design. He and Kathy feel that expresses their love; they like to say, “The Honeymoon’s not over!” And they’ve been married a long time. Isn’t that cool? The satillo tile floor is painted in the same manner as the table top. The entire surface is blocked in first, establishing the light and shadow pattern. 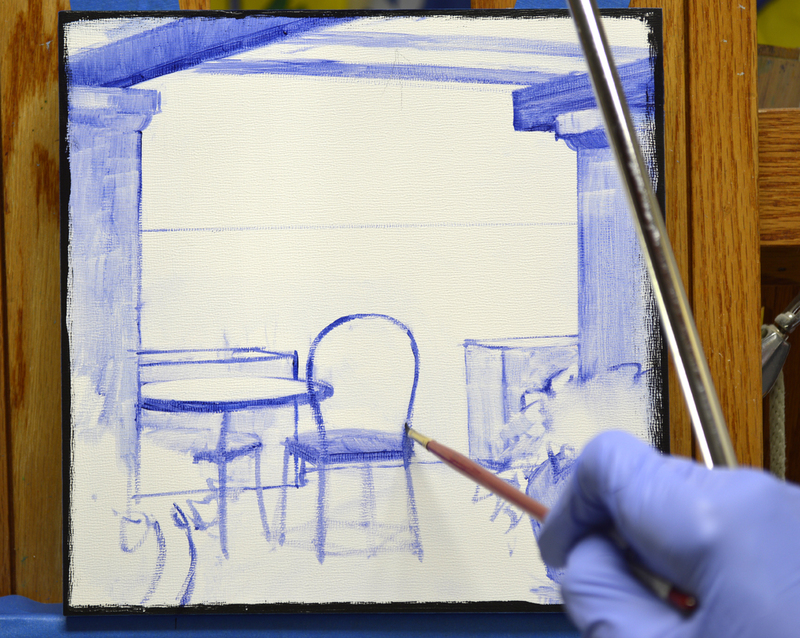 Then the table and chair legs are drawn with a mix of MUD (Ultramarine Blue + Alizarin Crimson) + Liquin. Perspective lines are pulled into the wet floor with a fine liner brush dipped in the same thin mixture that was used for the legs of the table and chairs. The floor is complete! We’ll be planting flowers in the containers in our next session…..and I think I’ll have another “Talking” video for you! Painting begins with the sky. 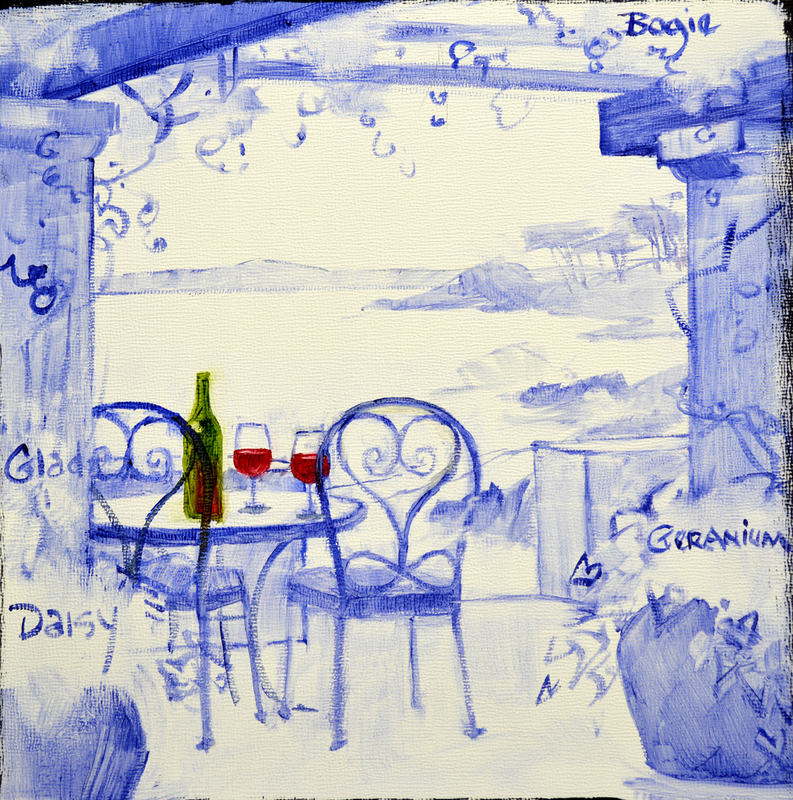 Cobalt Blue + White is used in the upper portion while a lighter mix of Pthalo Blue + White covers the area closer to the horizon. 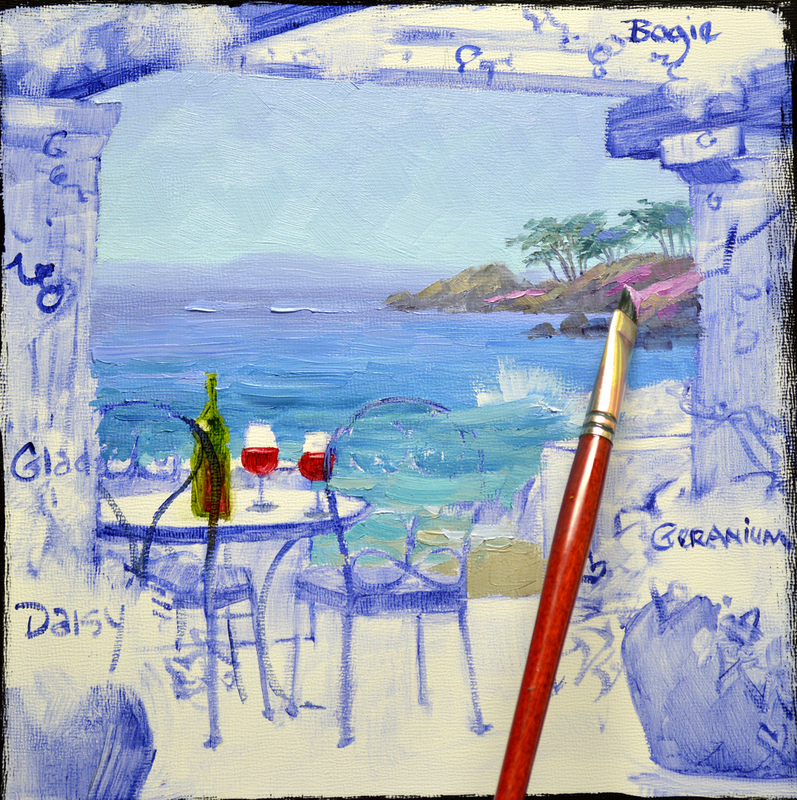 The mountains lining the far side of Monterey Bay are made of MUD (Ultramarine Blue + Alizarin Crimson) + a tad more Ultramarine Blue + White. OK…..YOU ASKED FOR IT! 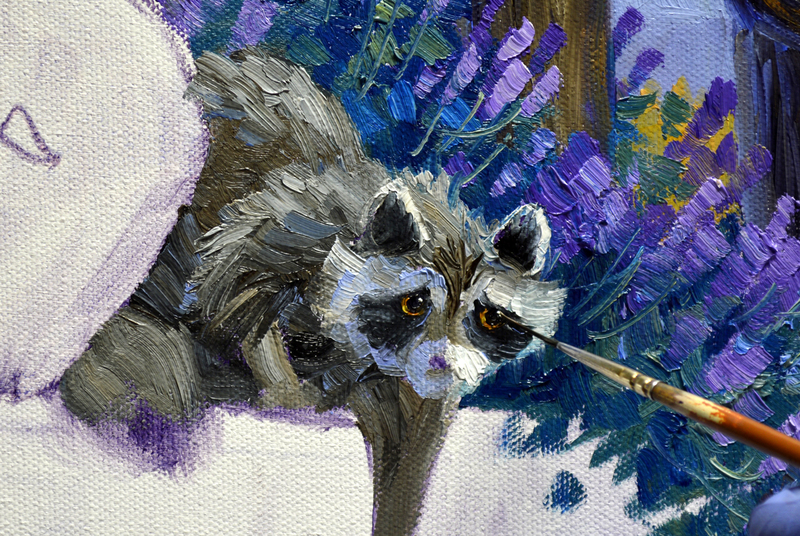 Audio on my painting video! I have a feeling the audio sensitivity on this video is a bit too high, LOTS of background noise. BUT…I will get there. You’ll have to bear with me as I’m learning. Around Easter time Ice Plant blankets the shoreline in the Carmel area. The bright pink is awesome. I use a mixture of White + Magenta to make a muted pink cascading over the rocks. You may click on any of these images if you’d like to enlarge them. ANOTHER VIDEO! 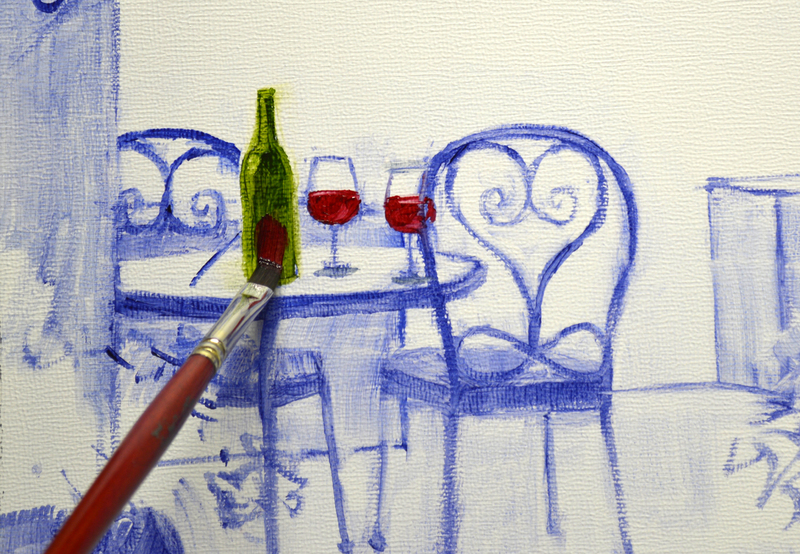 Painting the heart shaped back of the wrought iron chair. The chairs will be finished as the areas behind them are painted. Next the Pergola is constructed. Bougainvillea trunks wind around the massive columns supporting the wood beams. We’ll add the colorful, bright pink bracts in our next session. Please let me know how you like the new videos and if they’re helpful. With Big Hugs and Colorful Smiles! A new commission today! 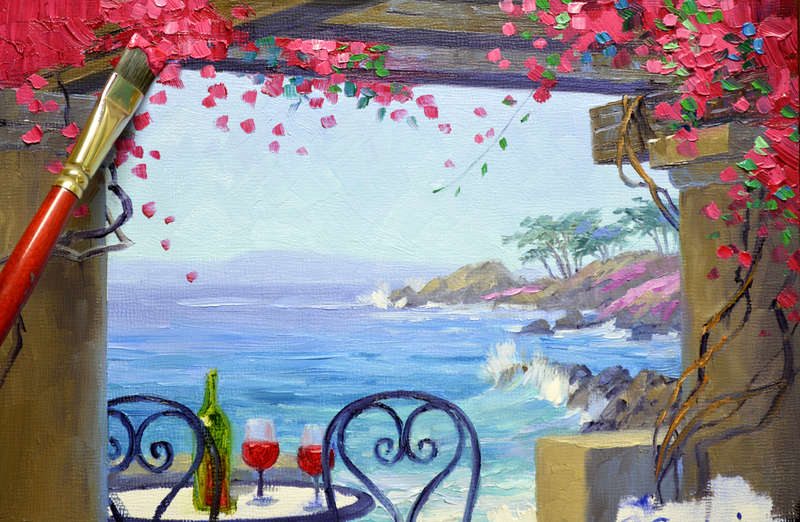 My collector saw this painting on my blog and decided he would like to surprise his wife with a similar piece! This VIGNETTE of Carmel also caught his attention. The piece is on a 10 inch by 10 inch cradled panel with the sides painted in black acrylic. 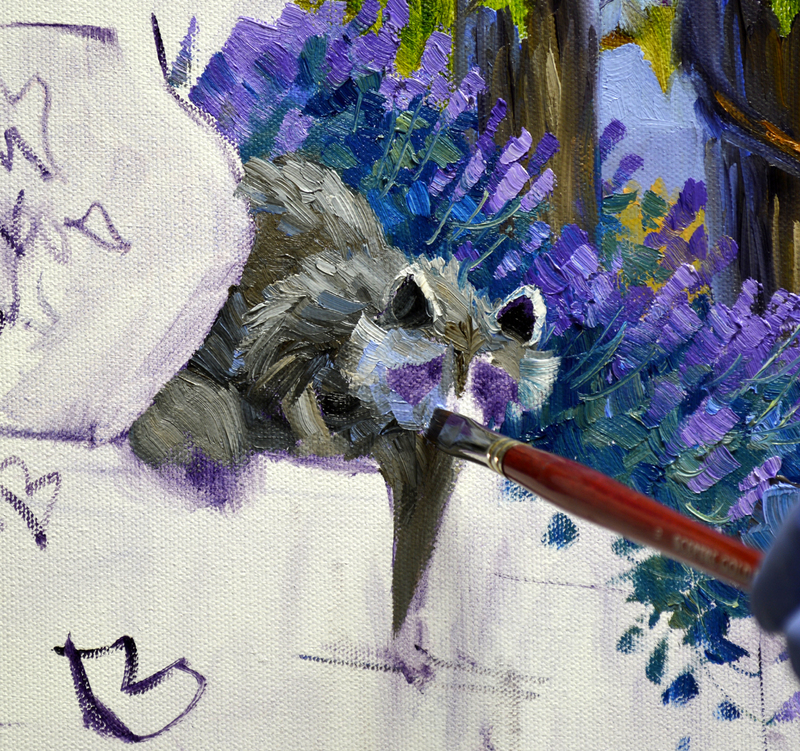 We start by sketching up the basic plan on canvas. Gary decided a pergola would be cool instead of the arch. 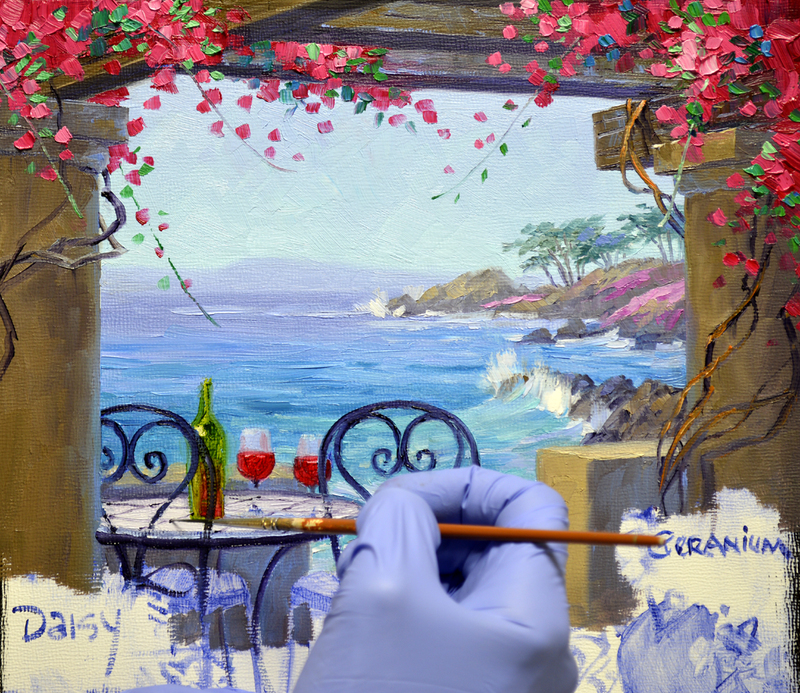 After establishing the horizon line I draw the basic architecture with a brush dipped in a thin oil wash of MUD (Ultramarine Blue + Alizarin Crimson) + Liquin. Please remember, you may enlarge any of the pictures, just click on the image. 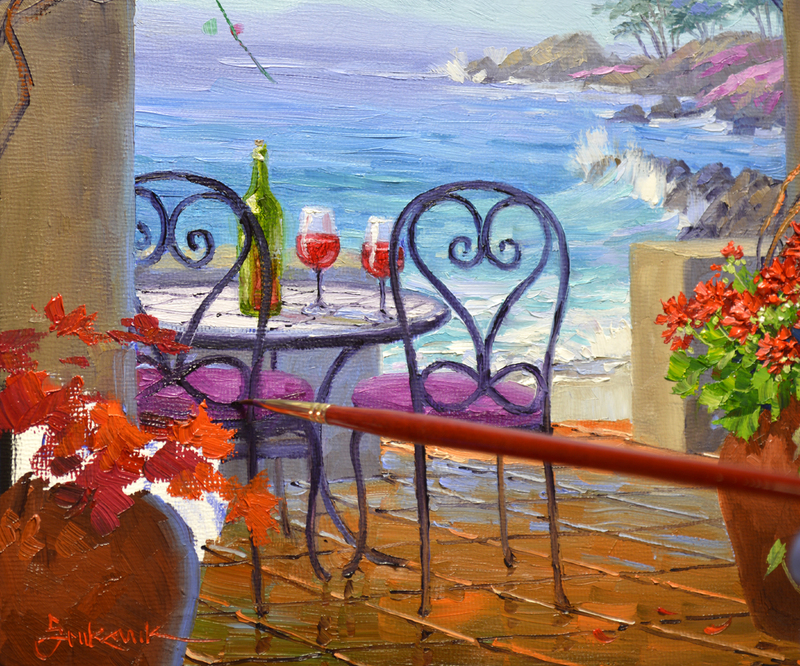 He suggested an opening in the courtyard wall to imply steps and an easy access to the beach below the terrace. Bracing against the mahl stick steadies my hand as I delineate the round back of the wrought iron chair. 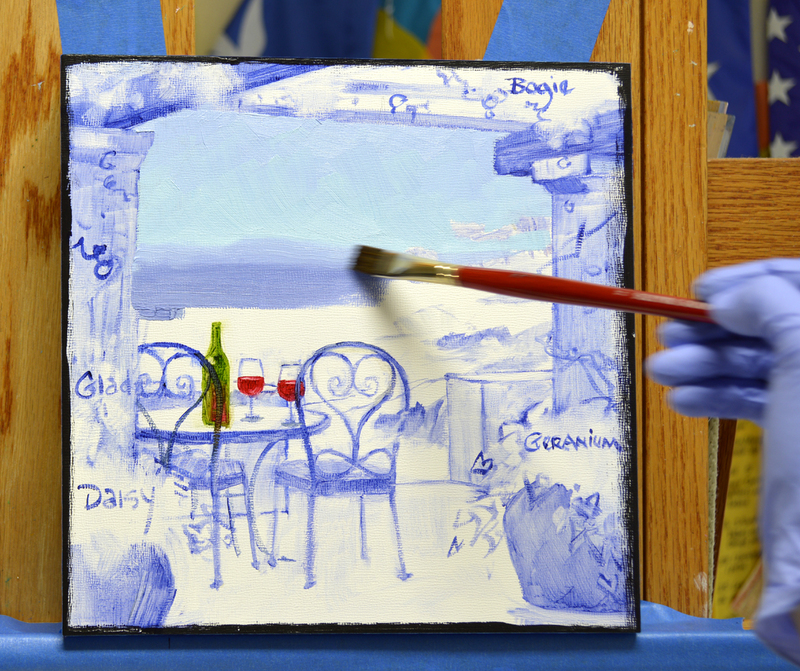 The wine bottle has been drawn with a thin mix of Sap Green + Liquin. 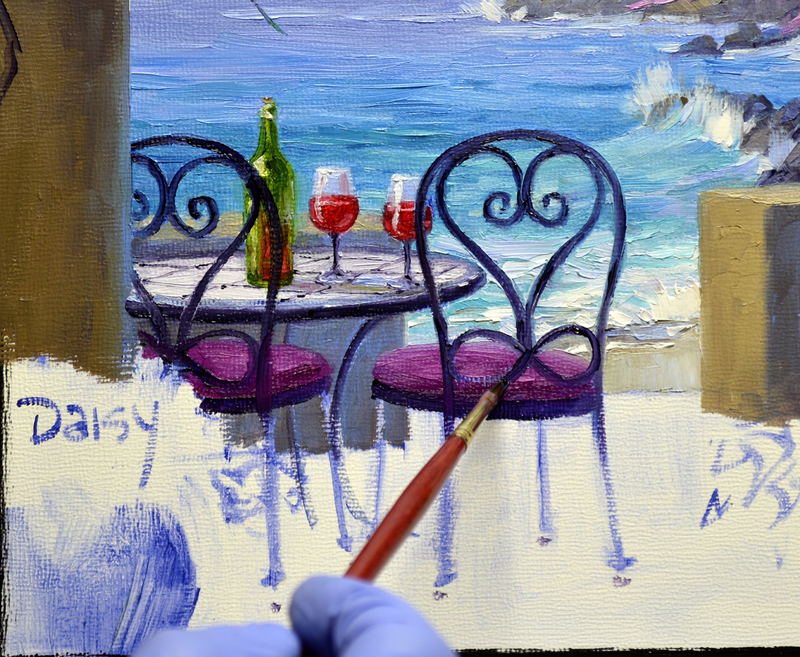 The wine is a wash of Alizarin Crimson + Liquin. Some of this mixture is pulled over the Sap Green to give the impression of wine remaining in the bottle. 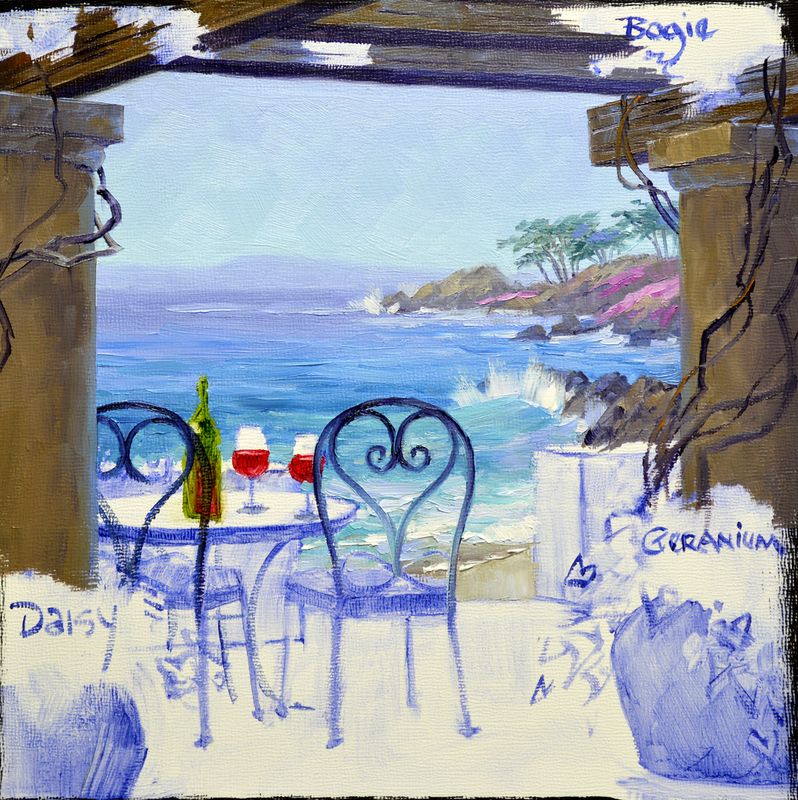 The rocky shoreline of the Carmel coast is drawn in the distance, flowers are labeled and we’re ready to begin painting in our next session. Hope you have a wonderful day. With Big Hugs and Colorful Smiles! Red Corn Poppies burst out from the rocks beside the Heron petroglyph. 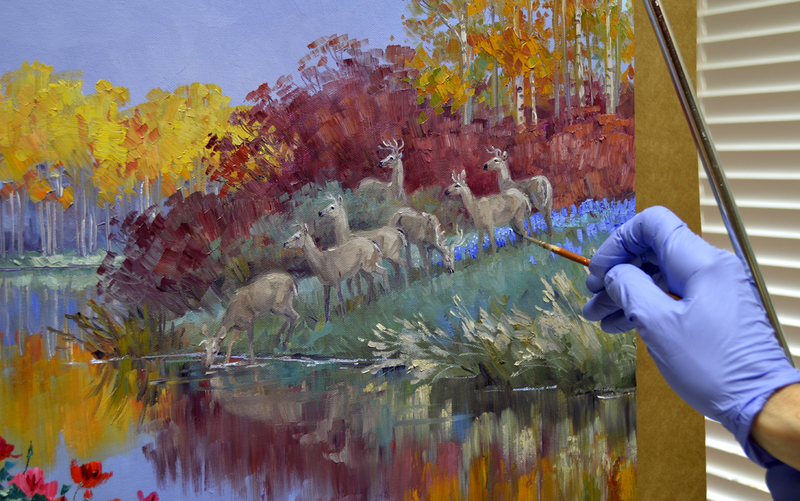 The foliage is made of combinations of Pthalo Blue + Cadmium Yellow Medium while the blossoms are blocked in with Cadmium Red Deep and Cadmium Red Medium. The blooms dance high above the leaves, therefore I reversed my usual sequence and painted the Leaves First and Flowers Last. 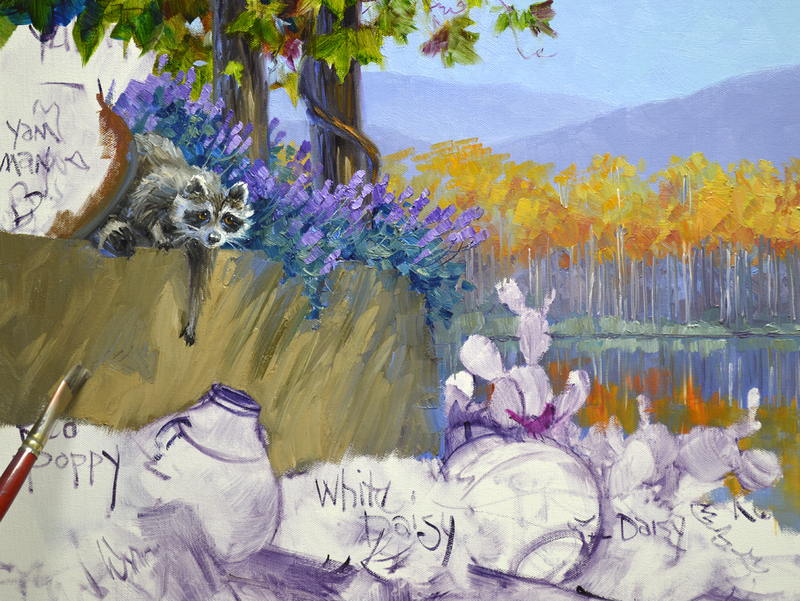 California Poppies clamor over the rocks to the right of the sweet bunnies. 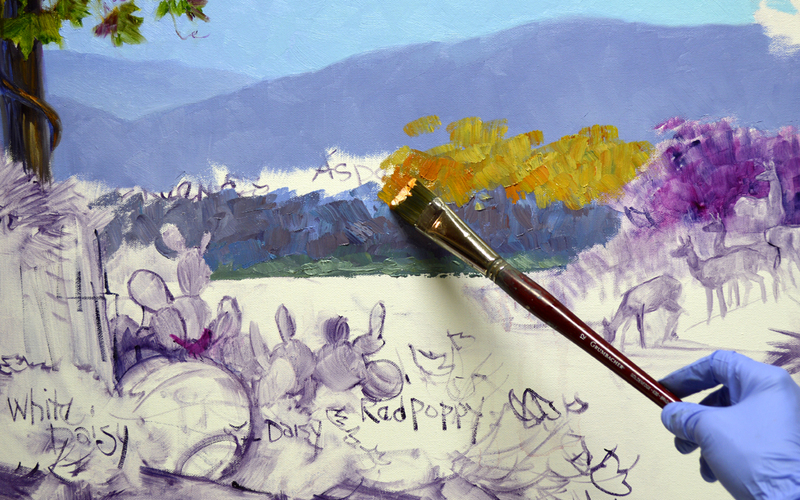 Their cheery blossoms are mixes of Permanent Rose + White, Permanent Rose + Cadmium Orange and Cadmium Orange. Some of the reds left over from the Corn Poppies are used for the blooms in shadow. Greens from the cactus make the leaves. Deep centers are added with a mix of Magenta + Liquin. 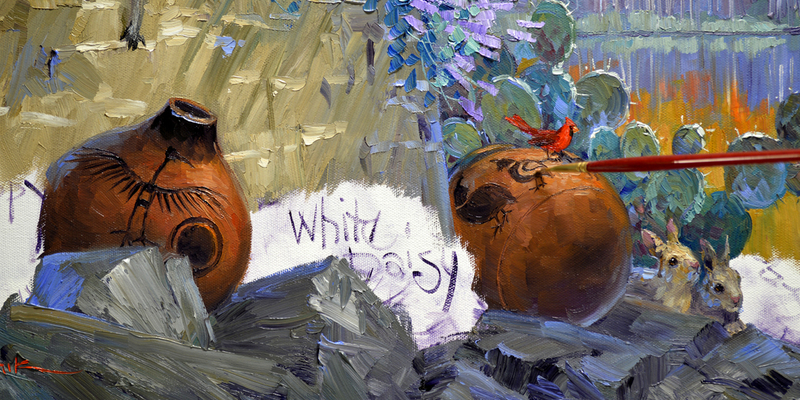 Blackfoot Daisies snuggle between the two gourd pots. 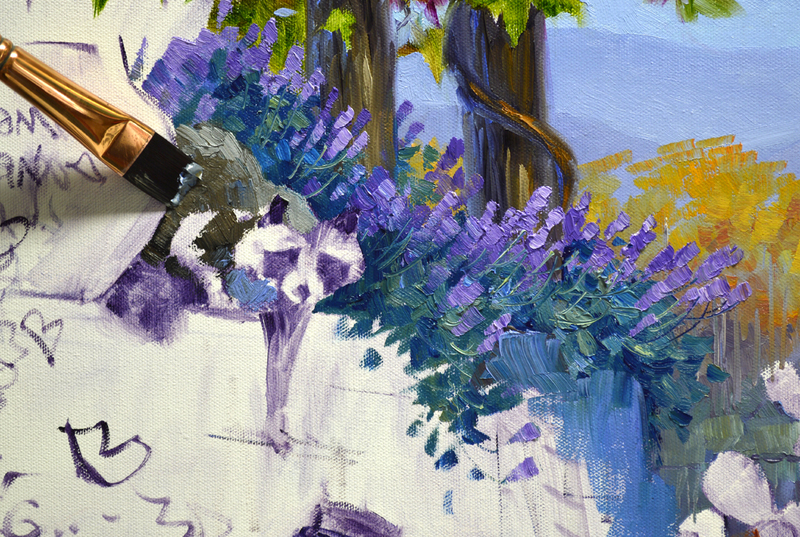 The flowers are blocked in with mixes of Dioxazine Purple + White, Pthalo Blue + White and Ultramarine Blue + White. 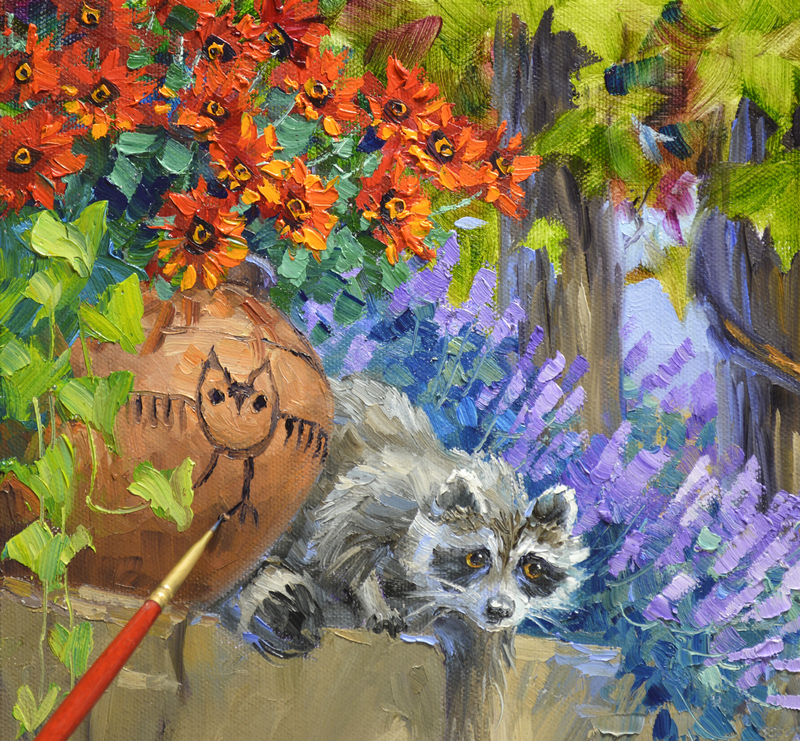 Jeana asked if I could add some bluebonnets somewhere in her painting. The bank with our herd of deer is a perfect place! My wrist is braced against the mahl stick to steady my hand as I delineate the little white “Bonnets”. Please remember, you may click on this or any of the other images to see them enlarged. Another request was a Blue Jay, so here he is getting ready to land on an aspen limb. Jeana and I had originally talked about Yellow Black Eyed Susans in the container by Charlie. 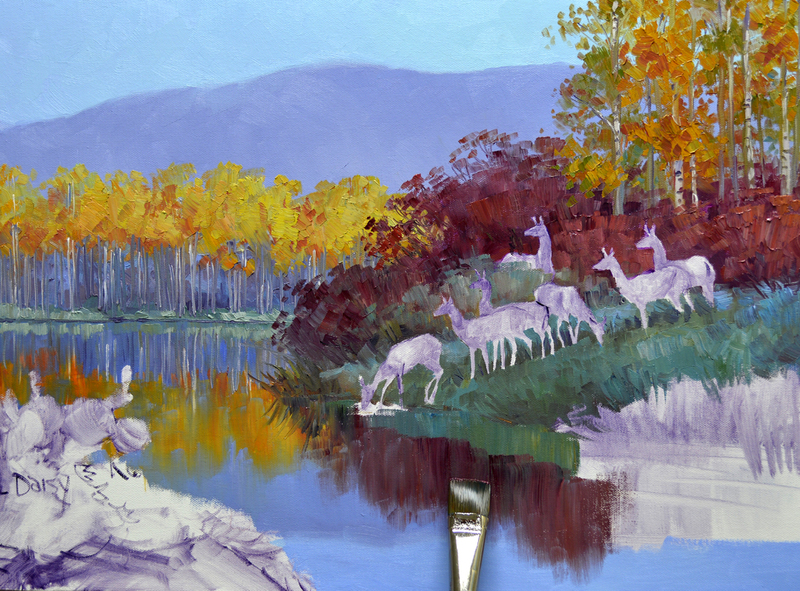 But now that the Yellow-Gold Aspen in the background are finished I realize that won’t work. 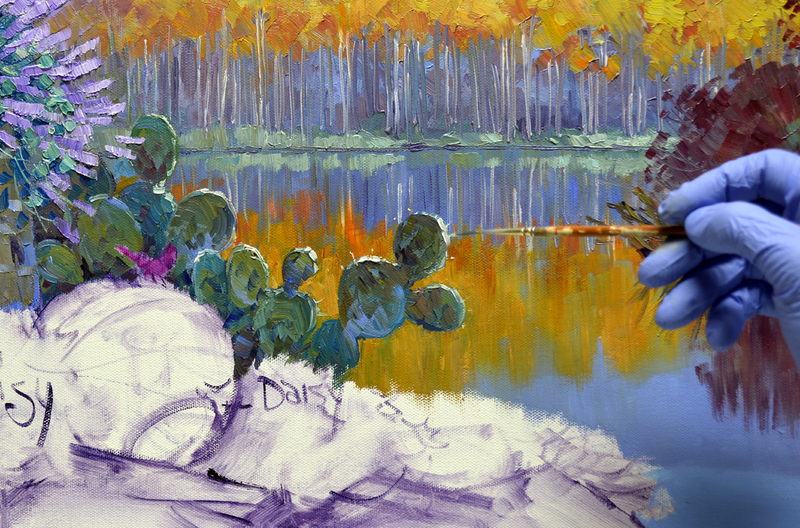 If we were to also have Yellow in the foreground our painting would not have any depth. The basic rule, Warm Colors Come Forward, Cool Colors Recede still works however. The Red-Orange Rudbeckia I’m planting here are warmer and brighter than the cooler Aspens in the distance. After dotting the centers in the Rudbeckia, I let the heart shaped leaves of a Sweet Potato Vine dangle out of the container. Now for some fun details, Petroglyphs! Jack and I used to live in Long Boat Key, not far from where Jeana lives. Herons are everywhere in that part of Florida. We used to have one that was a regular visitor in our yard, I’d feed him strips of raw bacon. At feeding time he would bang on our glass door with his nose (beak). So we named him “Nosey”! I thought it would be fun to put him on the container below Charlie. Please remember, you may click on any of the images to see them larger. 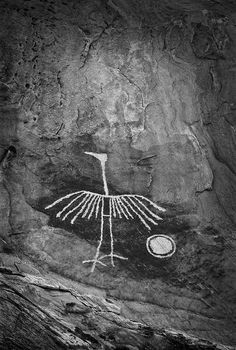 Jeana loves Owls and I thought this ancient design was cool. So an owl is etched on to the container next to Charlie. Quail are special little birds. When we lived in Arizona a hen raised her brood in our back courtyard. After they grew up I’d throw bird feed out for them in the evenings and call “HERE QUAIL!” They would come running from all directions, the plumbs on their heads bobbing wildly! It brings a smile to my heart thinking of those sweet little babies galloping across the Arizona desert. 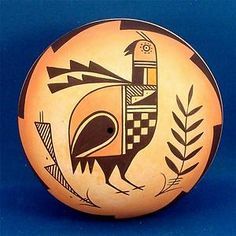 So we’ll have a hen and a couple of chicks parading across the gourd pot protected by Mr. Chippers. 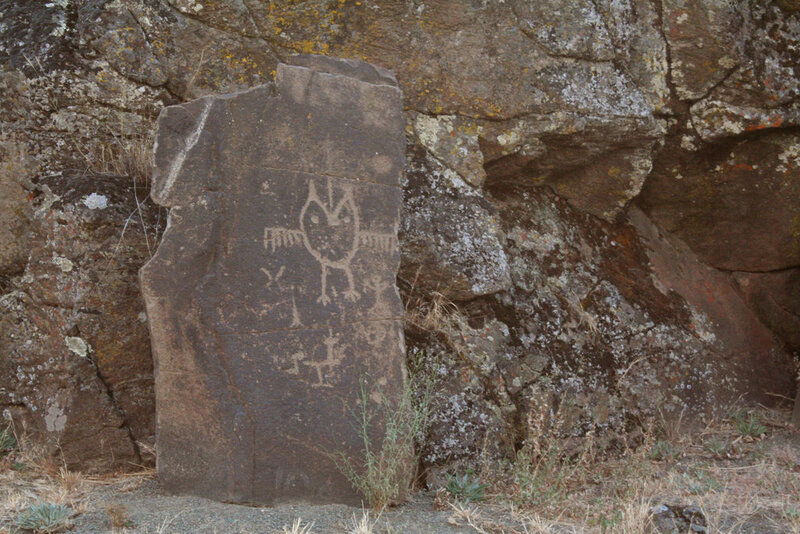 Petroglyphs…..DONE! 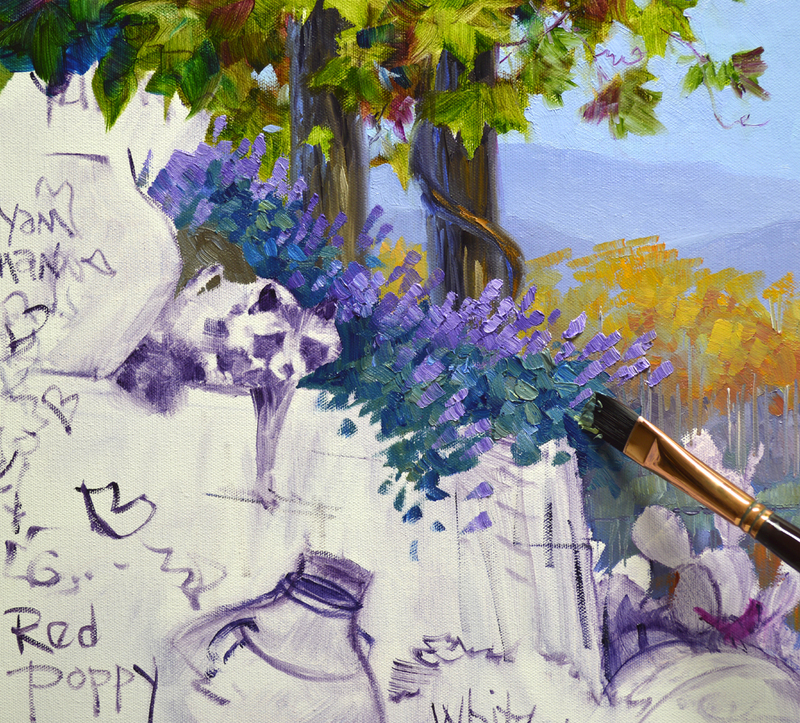 Next will be planting the flowers sprouting out of the rocky foreground. Hope you’ll come watch. But before we close for today I’d like to share a video with you. Sunlight pouring into the painting from the upper right casts Charlie’s shadow on to the wall below him. I have to make up the shape of the shadow, dragging it into the wet paint of the upright surface. 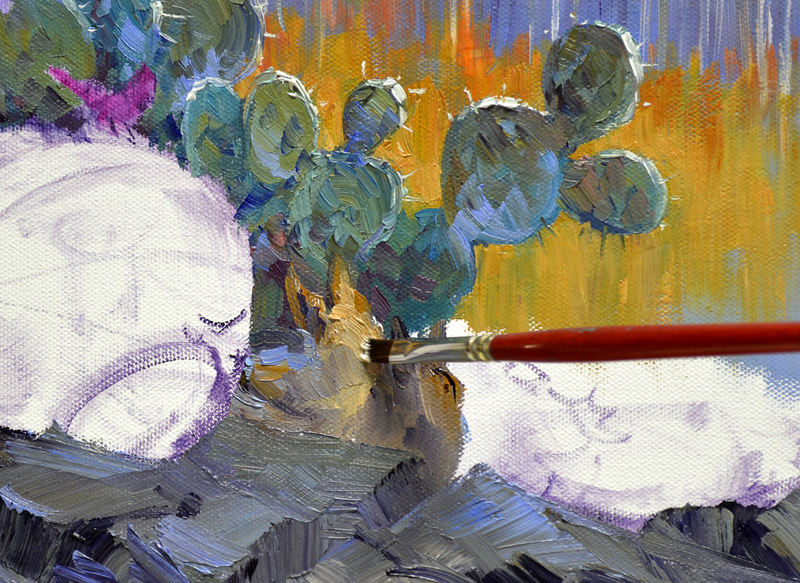 After the crevices and cracks are indicated on the wall I move to the cactus at the base. The prickly pads are blocked in with paint leftover from the riverbank on the right. The rims of the individual paddles are highlighted and sharp stickers added. Just click on the image if you’d like to see it larger. 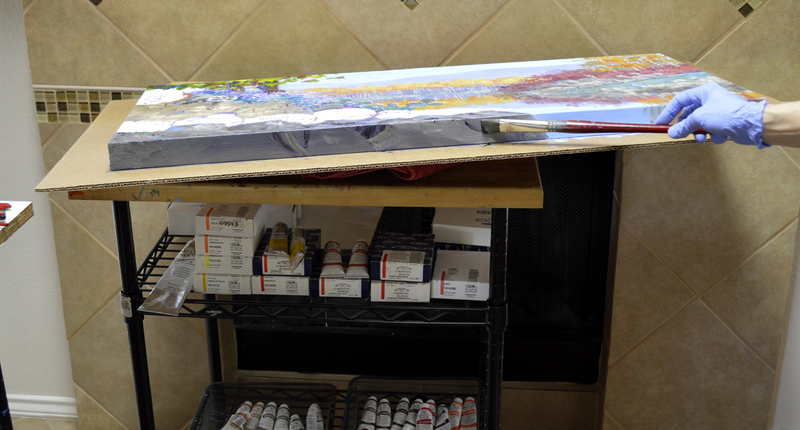 The entire unit of canvas and cardboard backing are laid flat in order to paint the rocks extending over on to the lower edge. 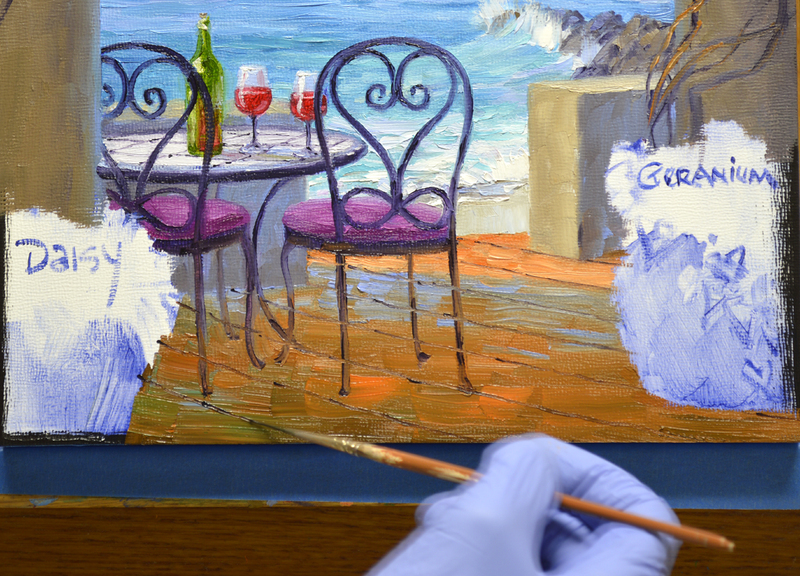 Would you like to know how the painting was attached to the backing? Just CLICK HERE to see. One day Jeana emailed and said two of the cutest little bunnies showed up in her yard. She was elated. 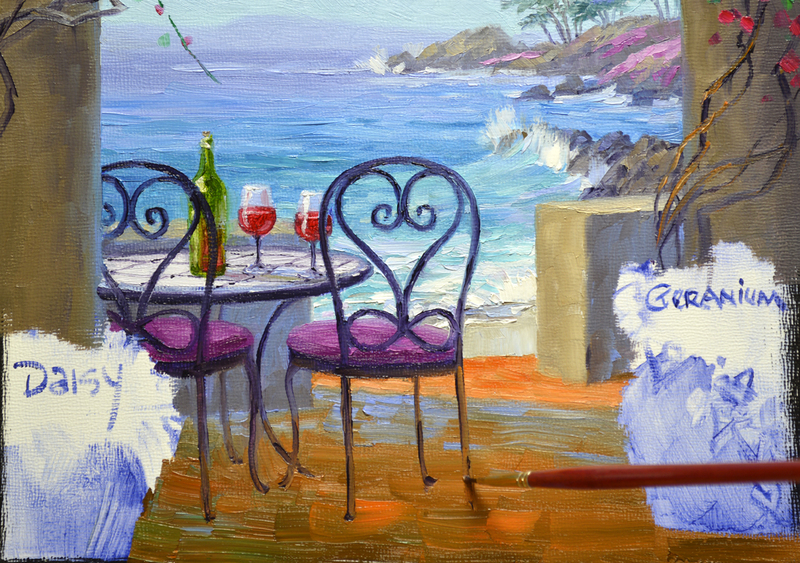 I made a little mental note right then to add them in her painting. 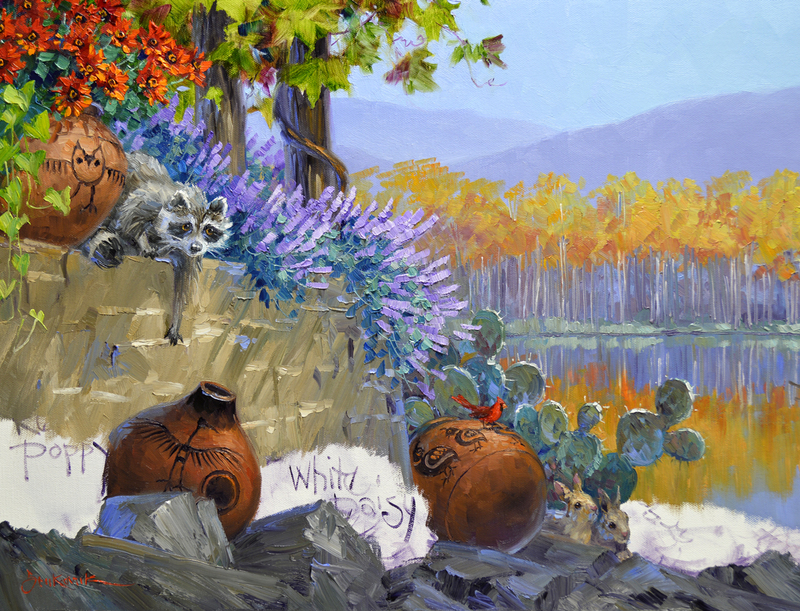 SO….here those cuties are, nestled by the gourd container at the base of the cactus! 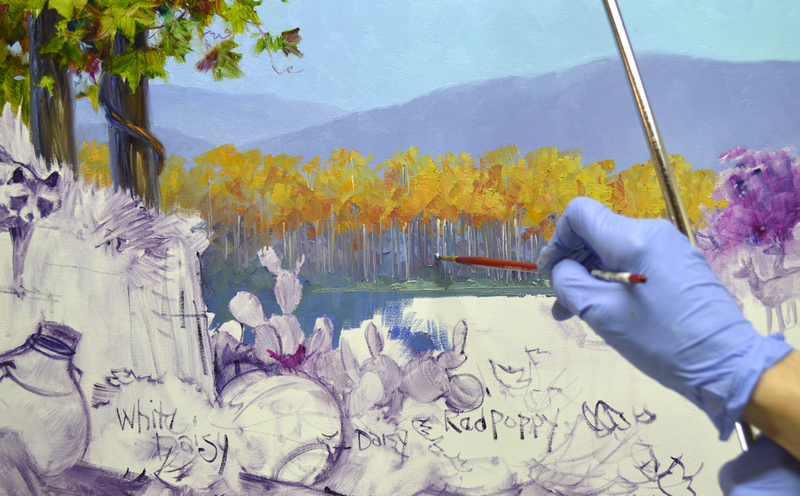 The finishing details are delineated with a fine liner brush. And of course we had to have a bright red Cardinal join the menagerie! When our Mr. Chippers shows up here I truly believe it’s God’s way of letting me know He and Jack are thinking of me. Our Lord is assuring me Jack is safe with Him and I’ll see him again one day in Heaven. It always gives me a wonderful feeling of peace. 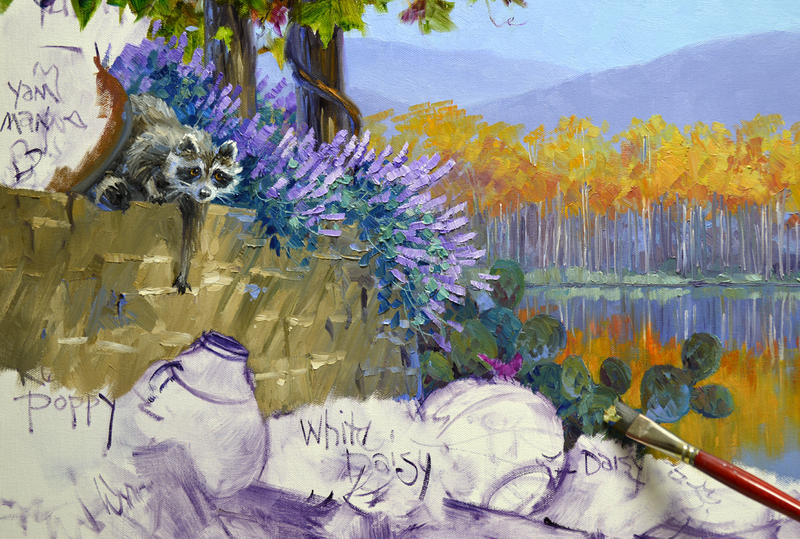 Lavender Salvia, painted with mixes of Dioxazine Purple + White cascades down the rock wall below the vines. 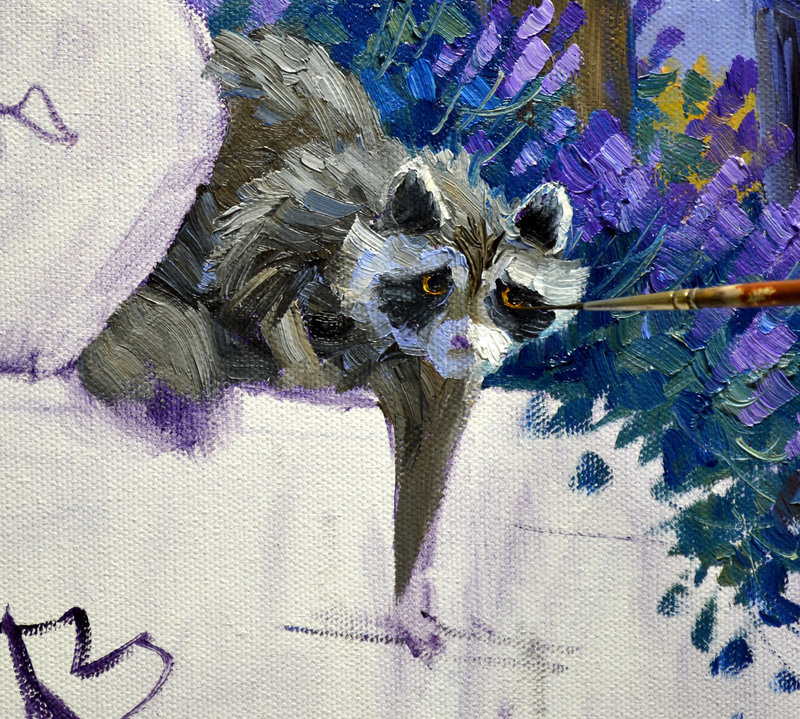 Next we start work on that cute fellow, Charlie. 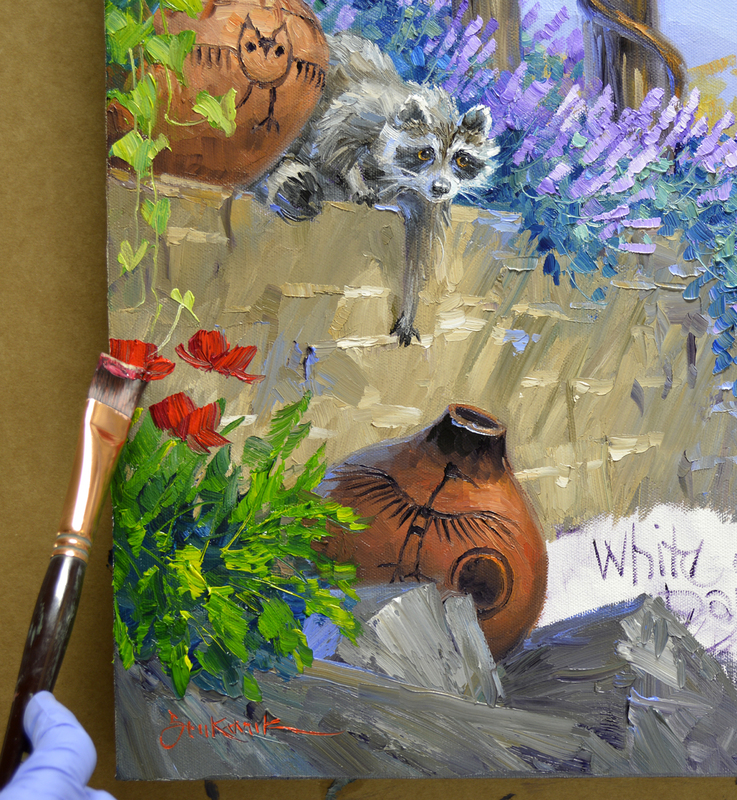 Combinations in various proportions of Burnt Umber + MUD (Ultramarine Blue + Alizarin Crimson) + White are used for his thick coat. 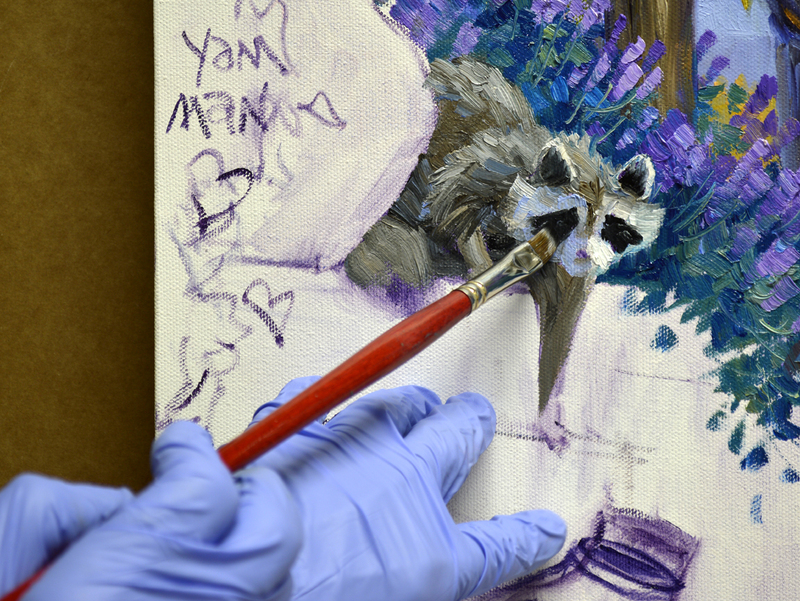 The shadow side of his white face is blocked in with MUD + White and Ultramarine Blue + a tiny bit of Cadmium Orange + White. Pure White is reserved to highlight the sunlit portion of his face. Now for his “Lone Ranger” mask! Please remember, you may click on this or any of the other pictures to see the image larger. Charlie’s eyes get the “Jack White” touch. After painting the entire area of each eye with MUD a crescent of brown is made on the lower left portion of the iris. The sun is shining into the painting from the upper right. If it were coming from the opposite direction the crescent would be on the lower right part of the iris. Pinpoint catch lights are placed at 1 o’clock. 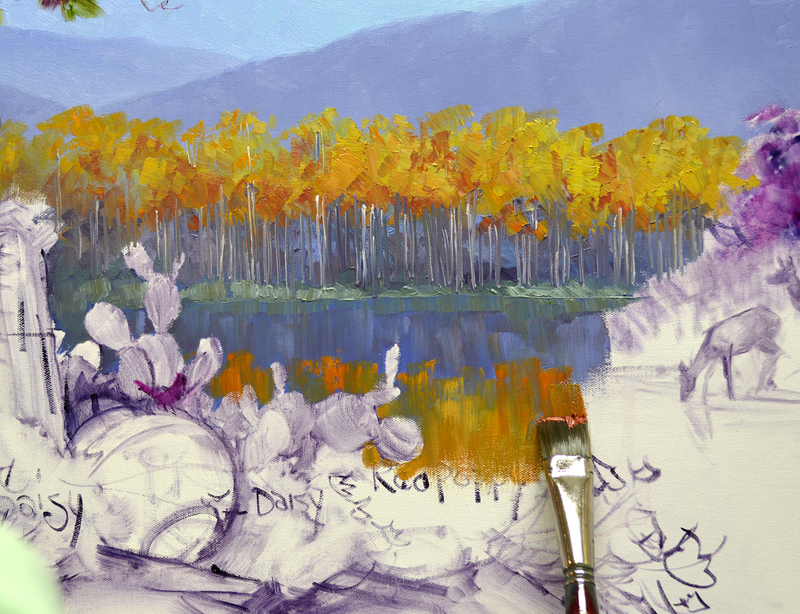 The aspen in the foreground are richer golds and rusts made of Cadmium Yellow Medium + Cadmium Orange + Alizarin Crimson, Cadmium Yellow Medium + Cadmium Orange + Pthalo Blue + White and Cadmium Orange + Alizarin Crimson. 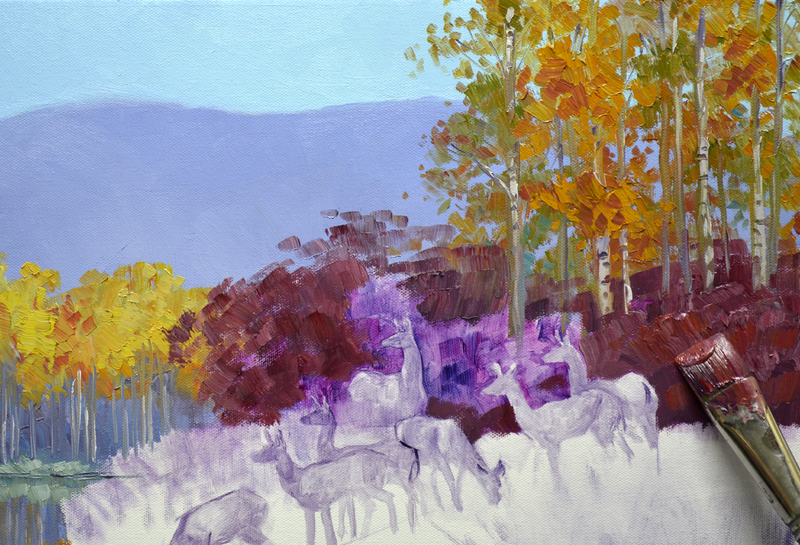 I keep the foreground aspen in shadow to accentuate the sun gleaming on the ones in the background. Low growing brush beneath the aspen is painted a dusty red purple. 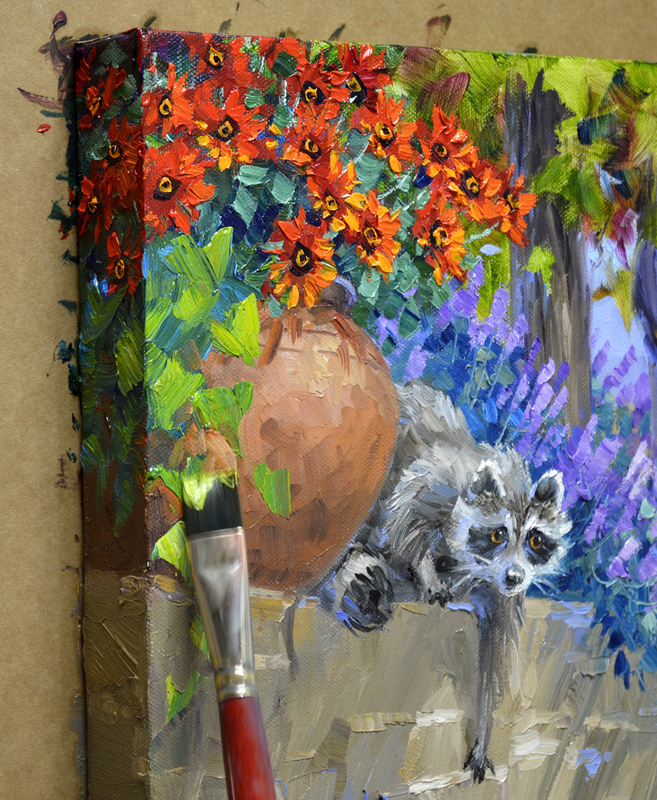 The foliage colors are mixes of Alizarin Crimson + Ivory Black + White. Reflections of the trees and grassy bank are pulled, straight down into the wet paint of the still water. 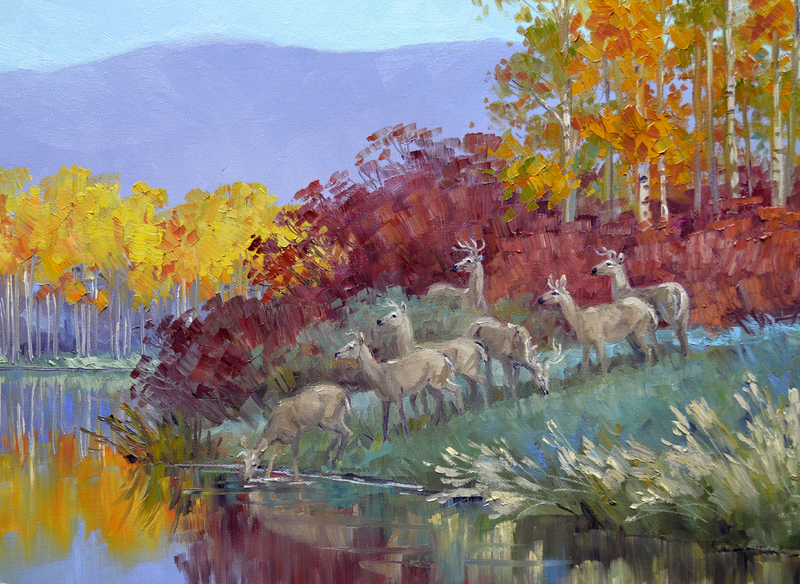 Now for the herd of deer grazing on the river bank. Jeana asked me to have 2 more mature bucks and 5 younger ones. 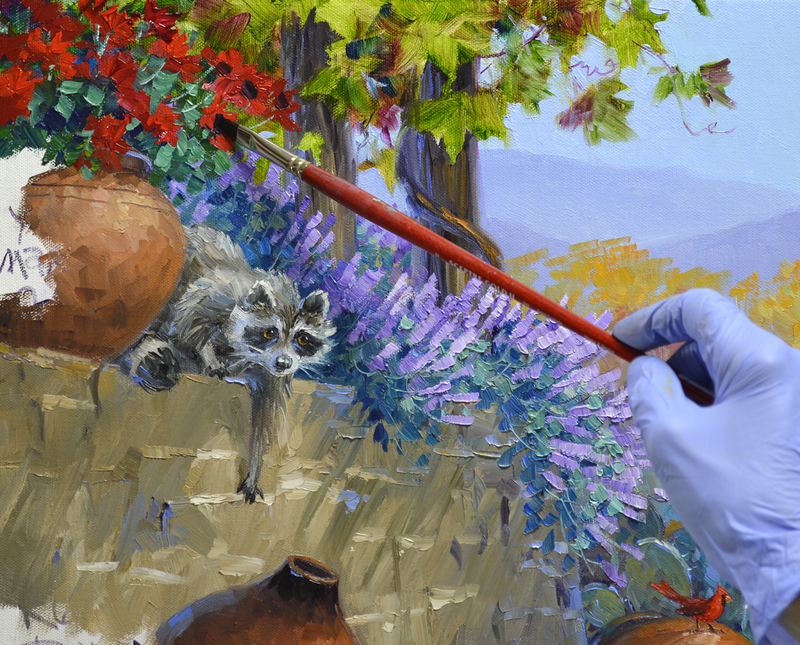 Their subtle coloring is made of combinations of Cadmium Orange + Ultramarine Blue + MUD (Ultramarine Blue + Alizarin Crimson) + White. 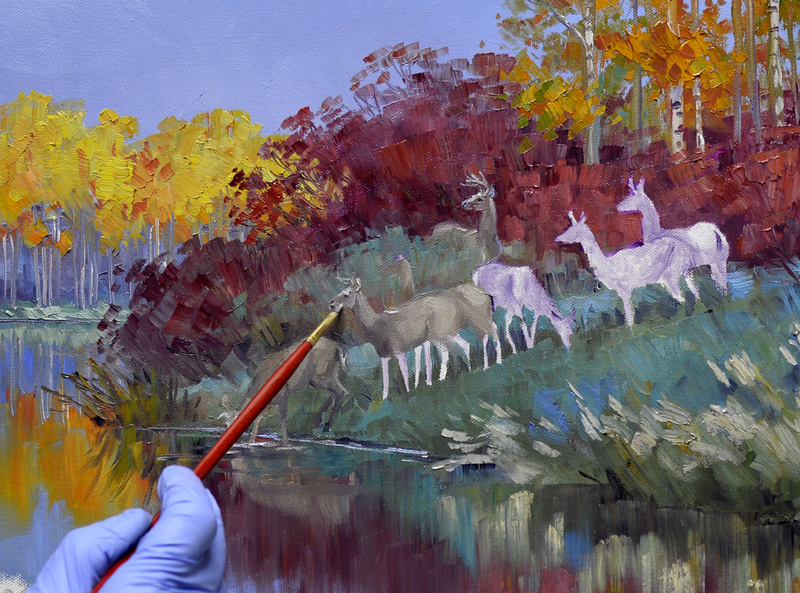 Bodies are blocked in first, then I come back to add the details on their heads and antlers. You may click on the image to see it larger. 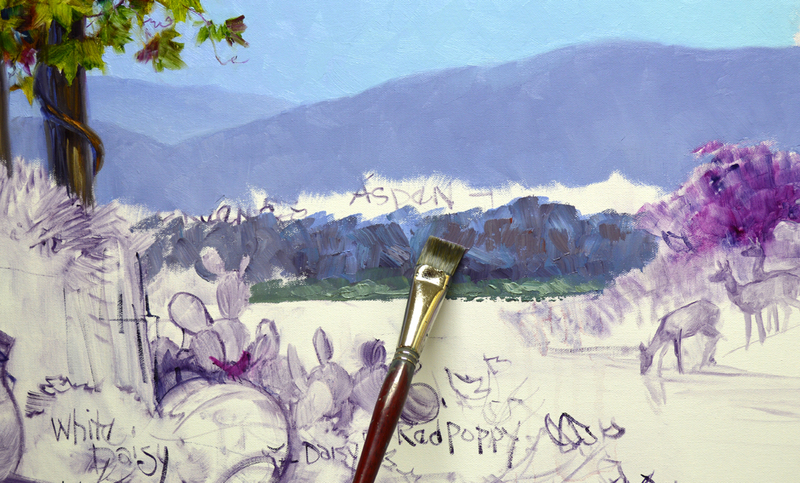 As usual we’ll start applying opaque color with the sky. It’s a cloud free day so I am only using three mixtures: #1. White + Cobalt Blue. #2. Mix #1 + White + a little Pthalo Blue. #3. White + Pthalo Blue. Sun pours into the piece from the upper right corner. 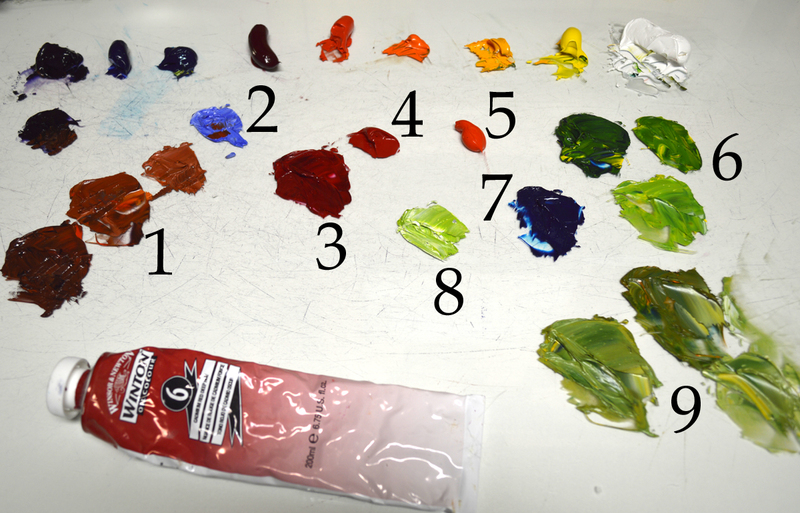 The darkest Mix, #1, is used at the far left. Mixture #2 is in the middle while Mix #3 is reserved for the far right portion of the sky. 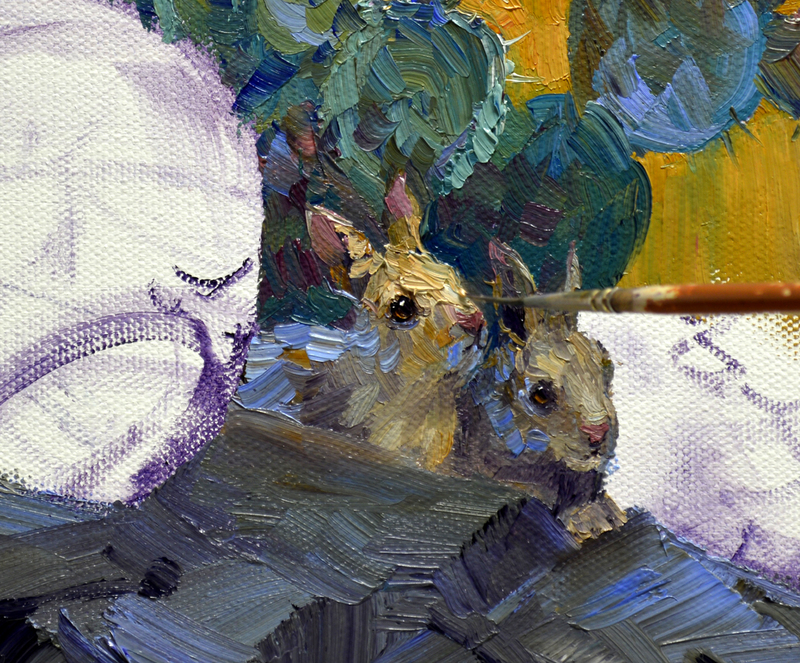 The transitions are blended with my large Bright (Square) brush. Please remember as you read through my blog, you may click on any of the pictures to see them larger. A dear friend of Jack’s and mine, Charity Dakin, generously shared several aspen photos she’d taken. Isn’t this amazingly beautiful? I’m going to use it for the background of Jeana’s painting. But before we go on, I’d like you to look at Charity’s website. She is a very gifted artist, I love her work. 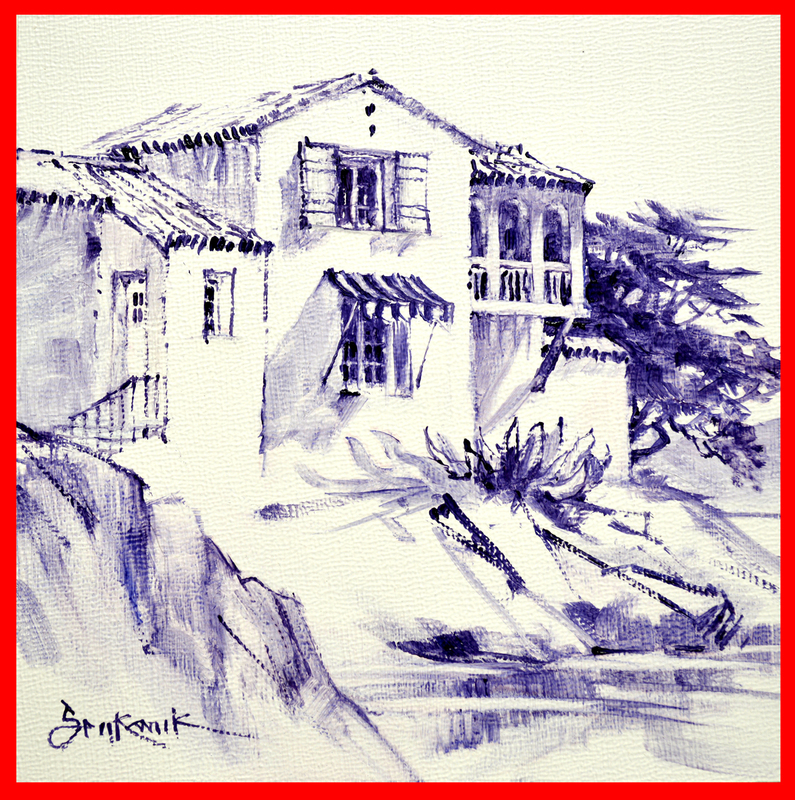 CLICK HERE to see Charity’s gorgeous oils and watercolors. 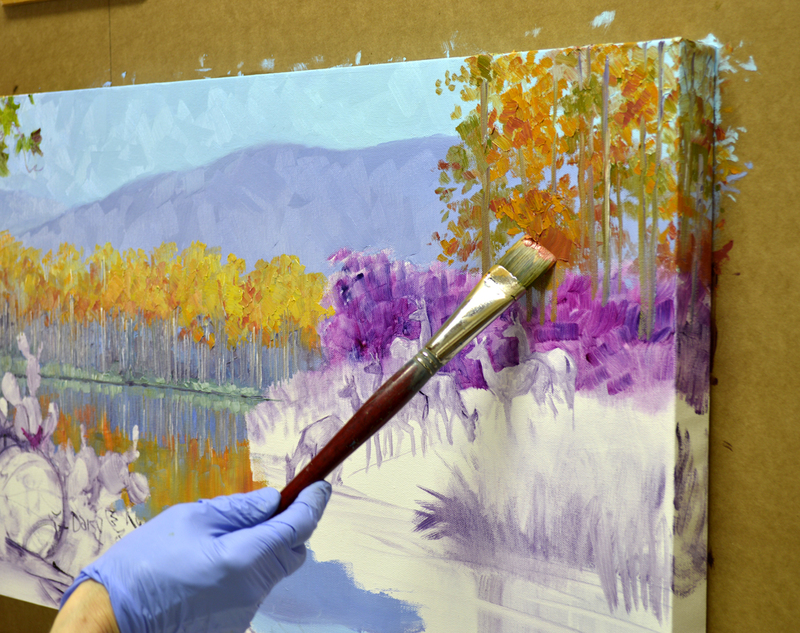 Mountains behind the aspens will offer a dark backdrop for the sunlit trees. 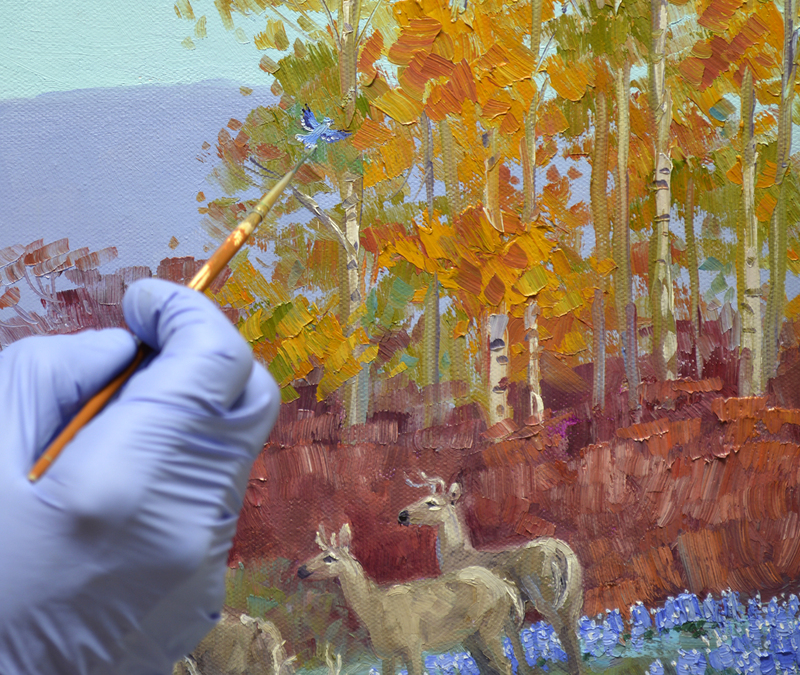 The brush growing beneath the aspens is blocked in with several mixes of MUD (Ultramarine Blue + Alizarin Crimson) + more Ultramarine Blue + a tiny bit of Cadmium Orange + White. The golden fall foliage is painted with muted yellows. Combinations of Cadmium Yellow Medium + MUD + White, Cadmium Yellow Medium + MUD + Cadmium Orange + White and Cadmium Yellow Medium + MUD + Alizarin Crimson + White are used. The light trunks are drawn into the wet paint under the trees. My wrist is braced against the mahl stick to steady my hand as I delineate them. 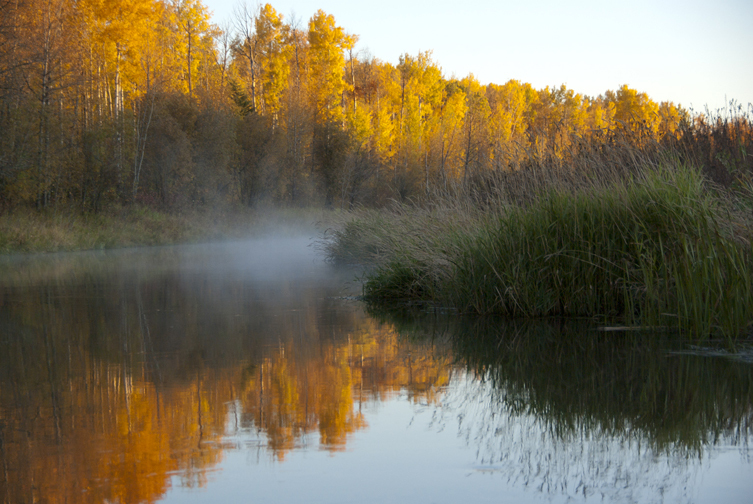 Using the same colors from the trees above; their reflections are pulled downward into the water. Still, still water; not a ripple anywhere! Hope you’ll come back soon. 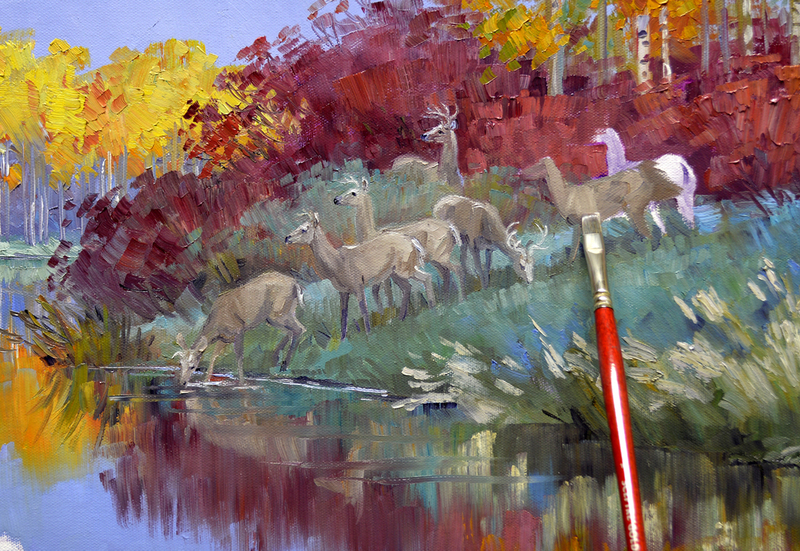 I’ll be working on the bank, trees and herd of deer on the right in our next session. With Colorful Smiles!